You are here: Home » Buttercream in a Flash! I think I’m starting to get a hang of this buttercream thing. I think it helps having different recipes to test out various methods. 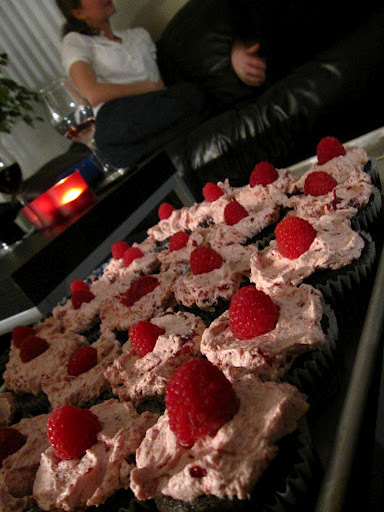 This time, twenty-something chocolate cupcakes were topped with strawberry buttercream, which were then topped with the previously mentioned special-for-purchase raspberries. The cake I used was a classic dark chocolate cake that I’ve used for years – it’s extremely reliable, light (yet rich), fluffly (yet dense), and delicious. There are definitely a lot of smudge marks on that page! It was a last-minute frosting job – the event I was going to was further away than expected and it was a last-minute decision to attend. I’m glad I did! As a result, as soon as I got home, the butter got softened, and away we go! The short form – 3 egg whites + 1 cup sugar, whisked over simmering water until the sugar was dissolved and the mixture was warm to the touch. 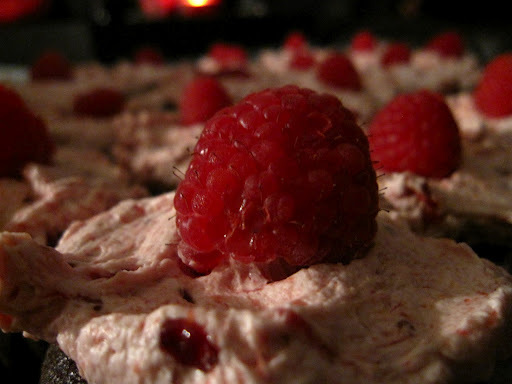 Stick that bad boy in a mixer and whip until good ‘n ready – and then gradually integrate a cup of butter and cup of jam. Yeah – not for the dieters, for sure, but it was delicious! And easy! It does look a little….congealed, right? But even in the Martha vid – they looked kind of gloppy. I’m wondering if the jam separates the fat a bit to make it not-as-appetizing-looking. So apart from that horrendous first buttercream, I’m 2 for 3! Let the good luck continue! ← Another Sunday. Another cake. Mmmmm.